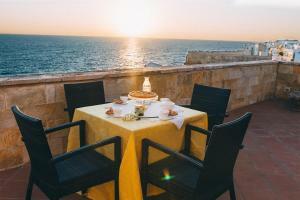 Levante Rooms is offering accommodation in Polignano a Mare. Certain units at the property include a terrace with a sea view. At the guest house, each room is equipped with a wardrobe. Rooms come complete with a private bathroom equipped with a shower and free toiletries, while some rooms at Levante Rooms also offer a seating area. An Italian breakfast is served daily at the property. Bari is 36 km from the accommodation, while Alberobello is 31 km from the property. The nearest airport is Bari Karol Wojtyla Airport, 49 km from Levante Rooms.